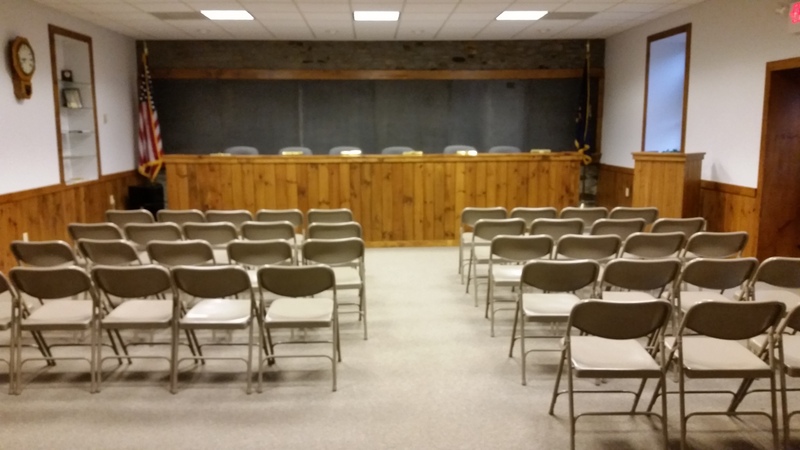 The regular meeting of the Bridgeton Township Board of Supervisors was held on March 12, 2015, as advertised, at the Township Building, 1370 Bridgeton Hill Road, Upper Black Eddy, Pennsylvania. Present were Supervisors Roger Keller and Michael Lynch. Supervisor Gard Holby was absent. Also present was Secretary/Treasurer Tammy Macaluso and David Shafkowitz, the Township Solicitor. No Executive Session was held prior to the meeting. Supervisor Keller called the meeting to order at 7:24 p.m. Supervisor Keller called for public comment on the meeting agenda. No public comment was received. 2-0, the minutes from the February 12, 2015 regular meeting of the Board of Supervisors were approved. BILLS/PAYROLL: Upon motion by Supervisor Lynch, seconded by Supervisor Keller, which carried 2-0, the bills and payroll in the amount of $17,758.45 from February 2015 were approved. TREASURER’S REPORT: Upon motion by Supervisor Lynch, seconded by Supervisor Keller, which carried 2-0, the Treasurer’s report from February 2015 was approved. Road Maintenance Agreement with Nockamixon Township – Solicitor Shafkowitz stated that a letter has been sent to Nockamixon Township Office Manager Keith Deluca requesting follow up on memorializing the maintenance relationship for shared roads between the two Townships.Sabatini Letter of Credit – Solicitor Shafkowitz stated that ongoing discussions are being held with Sabatini Counsel regarding replacement of the Letter of Credit. Planning Commission – Minutes have been received and are on file for December 2014 and January 2015. Supervisor Keller reported that the Planning Commission is still in debate and discussion over the form of a potential noise/nuisance ordinance update for the Township. Secretary/Treasurer – The annual audit is ongoing and almost complete.Secretary Macaluso reported that the Township office will be closed March 16, 2015 – March 23, 2015, but the Zoning Office will remain open during this time. Secretary Macaluso also reported that the Township office computer has been updated with the necessary hardware in preparation for the new accounting software, previously approved by the Board of Supervisors. B/N/T Groundwater Committee – Secretary Macaluso reported that Minutes have been received from the Committee and are on file for December 2014 and January 2015 meetings. The Groundwater Ordinance informally proposed by the Committee is being reviewed by the several Engineers from the participating Townships. Zoning – Secretary Macaluso reported that the Zoning Officer’s Report for February 2015 has been delivered to the Board. A copy of the Zoning Officer’s report is on file with the Township. Signage for Township Building – Supervisor Keller reported that he has been in touch with Phil Brandeau, who has been working on this project, who directed him to Fritz Yous who is preparing a cost proposal. PA DOT Multimodal Transportation Fund – Secretary Macaluso reported that Supervisor Holby will be speaking with the Township Engineer to receive a preliminary cost estimate for a project to be located by the river bridge which may be compatible with this grant program. Digitalizing Ordinances/Resolutions – Supervisor Lynch reported that he is seeking proposals for this project and is currently awaiting more information from a third provider. Supervisor Lynch expects to be able to report back to the Board at the next public meeting. DCNR Grant Program – Secretary Macaluso, at the request of the Board, looked into the availability of grants from DCNR for this fiscal year. Secretary Macaluso reported that it was too late to start a project for this year’s round of grants, but the possibility of participating in the program next year will be made a priority. Township Garage Addition Land Development Plan Submission Requirements – The Township Road Master presented a plan to the Board of Supervisors depicting the previously approved Township garage addition project. The plan has been reviewed by the Township Engineer and Township Zoning Officer. Solicitor Shafkowitz explained to the Board that, generally, an expansion of a commercial building requires land development approvals pursuant to the Township’s Subdivision and Land Development Ordinance. Accordingly, the Board of Supervisors is required to take action to waive the applicable land development application, escrow and fees so this project may proceed to building permit. The Township Engineer stated the plans for the addition are adequate and has recommended that the Board waive Land Development application, escrows and fees related to the filing of a land development plan for the project. Upon motion by Supervisor Keller, seconded by Supervisor Lynch, which carried 2-0, the Board approved the waiver of the applicable Land Development application, escrows and fees that would otherwise have been necessary for the Garage Addition project. Bucks County Health Department Yearly Letter Request to Treat Township Properties for West Nile Virus Protection – Upon motion by Supervisor Keller, seconded by Supervisor Lynch, which carried 2-0, the Board approved the County Department of Health’s request to treat Township owned properties for West Nile Virus protection. Internet/Phone Upgrade – Supervisor Lynch reported that he contacted Service Electric to determine available internet access for the Township Building. Service Electric stopped by the Township building to see where the service would come in to the building and where the modem location is currently. Supervisor Lynch reported that based on these finding there should be no problem upgrading the Township’s service. Before proceeding, however, Supervisor Lynch is going to contact them again to see if internet and phone service can be bundled and whether our franchise agreement also for “free” service to Township facilities. Email Program Update – Supervisor Lynch is going to research whether a Gmail account, which allows file sharing, would be possible and suitable for the Township. Supervisor Lynch advised that he will report back to the Board at future meetings. Tax Collector Deposit Request – Peter Rosswaag, Township Tax Collector is seeking the Board’s approval to make direct deposits into the Township account for the collection of Township taxes. This direct deposit feature is utilized generally, throughout the County. Upon motion by Supervisor Keller, seconded by Supervisor Lynch, which carried 2-0, the Board approved direct deposit of collected Township taxes in to the Township account. PUBLIC COMMENT: Carl Stokes, Township resident inquired if the position of Deputy Tax Collector was an elected position and the training required of a Deputy Tax Collector. The Board explained that the position was not elected and in the future the Deputy will have the same training as the tax collector. Also that the deputy was appointed by the tax collector and would be in position to continue the work of the tax collector should the collector be unable to fulfill his/her duties for some reason. The deputy would fill the position as needed until the term expired. The Board also noted that the Deputy was able to assist the Collector, if required and the Collector is still the person responsible for the collection. Marty Focazio, Bridgeton Township Emergency Management Coordinator, stated that he is currently updating the emergency management plan and would like to know if he can hold a meeting of his emergency management team and the public without providing or publishing public notice. Solicitor Shafkowitz stated that a meeting may be held by the Emergency Management Coordinator without publishing public notice. Mr. Focazio would like the Township to purchase a County radio, estimated cost being $2000.00. Supervisor Keller would like Mr. Focazio to provide details on this requested purchase. Mr. Focazio would like to designate the Township building as the EOC, which would require a key and an access code. The Board will advise Mr. Facazio on his request. Mr. Focazio stated that during activated emergencies, emergency supplies are dropped at the Palisades High School. He would like to be able to pick up these supplies in a Township truck and is questioning whether his Emergency Management team is covered under the Township insurance. Secretary Macaluso will make this inquiry to the insurance representative. Supervisor Lynch asked Mr. Focazio what is the deadline for the updated plan. Mr. Focazio would like to have the update complete by the end of the year. Being no further business, upon a motion by Supervisor Lynch, seconded by Supervisor Keller, which carried 2-0, the meeting was adjourned at 8:35 p.m., with the next meeting scheduled to be held on April 9, 2015, at 7:00 p.m. at the Township Building.